Fremont Indian rock art is often positioned on trails and commonly depicts mountain sheep, hunting weapons, and trapezoidal human figures. Out of curiosity I dug further to understand the difference between a petroglyph and a pictograph, if any. To my amazement, below is what I found ! Petroglyph is an image or design cut into a rock surface without the use of pigment or coloring. In canyon country, desert-varnished sandstone was most commonly used. In desert areas, this brown or black varnish builds up on rocks after prolonged exposure to the elements. The tool usually used to produce petroglyphs was agate, chert, or jasper. Pictograph on the other hand are painted on light-colored sandstone surfaces. A mixture of sumac, yellow ochre, and pinyon gum was used to make a black powder; yellow from rabbit brush and red from red ochre or the roots of mountain mahogany. Animal fat and plant oils were used to bind the powders together. Anyways, Utah has some of the most spectacular rock art – found in Nine Mile Canyon northeast of Price. The canyon is actually 40 miles long, probably the name -nine mile- is a misnomer :). Beware, this Canyon is remote, hostile, unblemished and dryly beautiful. Called “the world’s longest art gallery” it is home to numerous rock art panels, including the below famous “Hunter Panel”. Most of the rock art was created by the Fremont Indians who occupied this area some 1,000 years ago. The “Hunters Panel” is one of the more famous and most recognized Fremont style petroglyph rock art panels in Nine Mile Canyon, Utah. 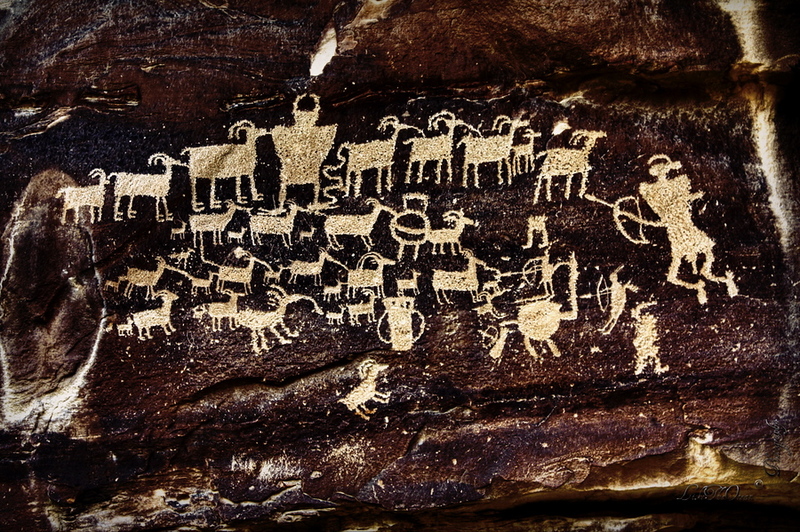 The panel depicts 36 bighorn sheep, 5 hunters, a snake, and several ambiguous images. Notice how the bighorns are connected by consanguinity lines – probably depicting a natural relationship that co-existed.